Yesterday we spoke to artist and poet Momtaza Mehri, who is the second Young People’s Laureate for London, recently taking over from poet and director Caleb Femi in the role which was launched by Spread The Word in October 2016. In October, Mehri will headline the Be My Next Inspiration Young People’s Laureate for London Tour of six outer London boroughs with 10 of the city’s leading poets, rappers and beatboxers, including Anthony Anaxagorou, Bellatrix, Bridget Minamore, Shay D, Dizraeli, Remi Graves, Cecilia Knapp, Raymond Antrobus, Rob Bradley and Deanna Rodger. Her specially commissioned poem – No Name Club – weaves unknown history with conversations held with 13 to 25 year olds in libraries in the campaign’s participating outer London boroughs of Kingston, Barking and Dagenham, Bromley, Redbridge, Brent and Sutton. Atmospheric, powerful and beautifully shot, the filmed poem celebrates the richness of culturally diverse communities and questions the upheaval and uncertainty created by gentrification. 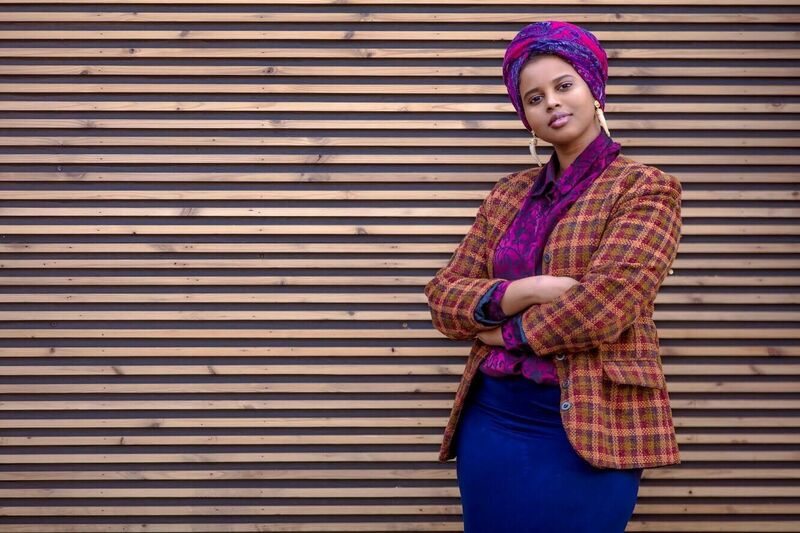 Congratulations on becoming the Young Poet Laureate for London! When I heard about the upcoming tour I thought it sounded fantastic and really wanted to talk to you. Can you tell me about it? Well essentially the tour is building on some stuff that I was already doing when I got the role, which was to go into schools in the outer boroughs of London, places like Dagenham and Barking, to go in and work out the kind of resources that they have around them if they want to put on events – not just poetry events but also other kinds of workshops, to listen to them and just getting to know what they need in their area. Then going back to those areas, performing and taking part but also seeing what they put together. It all sounds brilliant. I feel like in the last five or ten years in British poetry there has been this amazing surge in new voices, I came across people like Ray and Deanna a few years ago through all the events and workshops that they put on across London. What are your own inspirations? I think what has happened is there has been a line of continuity. What often happens is that you do a workshop for young people, and then one of those young people is interested in writing more poetry, and then after 4 or 5 years they have gone through a number of initiatives and become established in their own right, so it becomes this circle. Especially because there are a lot more initiatives available right now, obviously things like Barbican Young Poets, but also smaller ones like The Writing Room and things like that. These are all things that I’ve taken part in, but in general you do see young poets coming up through a lot more avenues now, rather than just having say four young poets… For me I was quite introverted really and moved about a lot, so I wasn’t actually able to be at any one place for a long time, but it’s great to see young people benefiting from it. I really love the poem and film that you were commissioned for – No Name Club. Am I right in thinking that the name came from a 19th century football club in Kilburn? Amazing. Well it was a great poem but I especially enjoyed the video that went with it. I was wondering, as your predecessor in the role Caleb Femi did a lot of work with music and film, whether that was something that you were looking to continue? As in reaching out into other forms other than books and spoken word performances. It’s an interesting point you pick up on, as each poet laureate of course tailors the role to their own interest. The role really is divided into two different objectives, one is to engage with young people, but the other is for your own personal development, so when it comes to that, I think I’m more interested in working in the art world and with visual arts. So I’ve been doing a lot of things like that, and I have an art book coming out next year for example, and just doing different talks at art fairs, I did a talk at Frieze last week, so yeah, just things like that really. But there are also projects which might overlap, you might be commissioned to respond to something like an exhibition or a film for example. But for me the areas that I’m interested in are mainly cultural criticism and the visual arts. Are you able to talk a little bit about the art book that you mentioned? Yeah of course! So it’s commissioned by Book Works, and the editor is a visual artist and film maker. It’s not a traditional poetry or art book, it’s more a fragmentation of some essays, some poetry, some photography, and some things from archives, a whole load of different genres, which is very much in the nature of the kind of thing that Book Works put out. It’s quite interesting however to have a chapbook out, and then do this before a first full poetry collection, but to be honest that’s just where I’m at at the moment. I’m still doing a lot of poetry and poetry related things in this role of course though. I think it’s definitely great to diversify in any artistic practise, but particularly in this role! It helps normalise poetry for a lot of people that might have some kind of cultural stigma towards poetry as an art form. To go back to the poem No Name Club, what I really liked about it was that within the piece appeared all these different image layers of different histories that exist in the city, there’s that great line for example about the room three doors down from the library where the nuns used to live which is now a Paddy Power… To me this suggests gentrification of London and the marginalisation of communities, but I wanted to ask you about what you thought the challenges are to being a young person in London at the moment, and what kind of change you would like to affect in the role? Well when I was approached with this commission, the theme that we were presented with was ‘change’. My go-to first reaction was that change isn’t always necessarily good or bad, which is what I wanted to come through in the poem… But it’s also that in general recognising that in this role I have gone to many different parts of London that I had never been to, and this realisation that there are many Londons. To me it was just understanding and trying to understand that London can be a constricting place, but it can also be a source of inspiration. I have had quite a complicated relationship to it because it has been a home base to me for a long time, but I’ve moved out of it quite a lot, but these were the streets that I actually knew best, so I was in that position where you’re always returning to it, and when you do that, when you go away and come back a lot, I think you notice change a lot more. It can be quite jarring. Also for me I associate people with places a lot, and so when people pass away or move away, then that change becomes inevitable. But I think in terms of writing about that change or coping with change as a young person or an artist, I would say the most important thing is having a strong community around you, because then when that change happens, you still feel anchored, because you have those people around you, even when you might feel powerless in other aspects of your life. For more on Spread The Word go here. Next articleThe London Magazine Poetry Prize 2018 – Winners Announced!